The 2018 World Prize for Integrated Development is awarded to Mrs Graça Machel for her significant social justice achievements and tireless work on behalf of women and children. 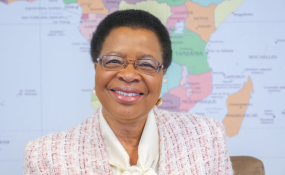 In particular, Mrs Machel is recognised for her leadership of the Graça Machel Trust, a Pan-African advocacy organisation focused on child health and nutrition, education, women’s economic and financial empowerment, leadership and good governance. Owned by a Foundation and its employees, the NIRAS Group creates sustainable development solutions across the globe. With 2,200 employees worldwide and growing, NIRAS implements more than 7,000 projects in over 100 countries, working with everything from construction, energy, utilities, environment and infrastructure to development consulting, the process industry, architecture, GIS, geo-data and automation, as well as urban planning.